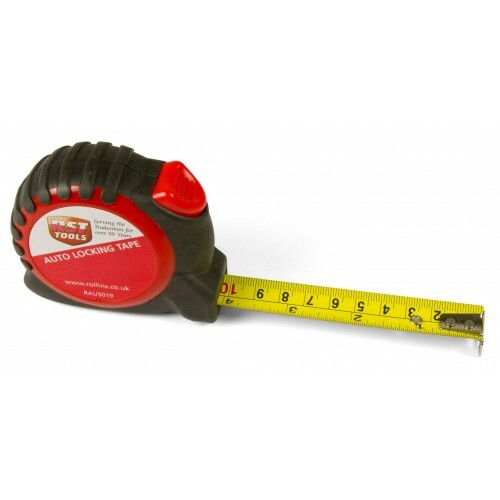 Best suited to construction projects, choose our 3m / 10ft Auto Lock Measure Tape. As with the rest of our range here at The Ruler Company, it has been manufactured for professional use alongside educational means. We use high-quality and durable materials throughout, including a rubberised case, to extend the tools lifespan. In doing so, we aim to bring you tools that you can rely on for many years to come. This measuring tape has a retractable design which rolls back into the chunky, durable case. When extended, it offers you a solid body to hold on to while lining up the tape accurately. This can be either along an existing straight line or against an item in the distance. When fully extended, the tape can be locked into place to minimise the risk of injury on fingers and also allowing you to move freely while taking measurements. The large red button on the case depresses to retract it back into the compact case - ideal for transportation or compact packing. Whether you're taking note of the size of an item of furniture or measuring out space in a room for a new project, this is the tool for you. It has a durable and reliable strength that suits rigorous environments and promises to last for longer. For easy reading, the bright yellow tape features black and read numerical markers alongside more specific line increments too. For bulk orders, we are able to offer reduced individual prices. On orders of 10 or more, our individual product price is just £3.74. On order of 100 or more, our individual product price is just £3.16.